Not only is this a good idea but if someone asks you what you got your partner for Valentines day you could reply with “I gave her the beef” which I think is a euphemism and a half. I get asked every year what I’d like for Valentine’s Day and I never know what to suggest. Soppy cards aren’t really my thing and it got me thinking about what I could make for other men out there like me. I had a ‘Eureka’ moment one day when a customer came in with a bunch of flowers. I started playing around with the idea and realized it was actually quite easy to do! 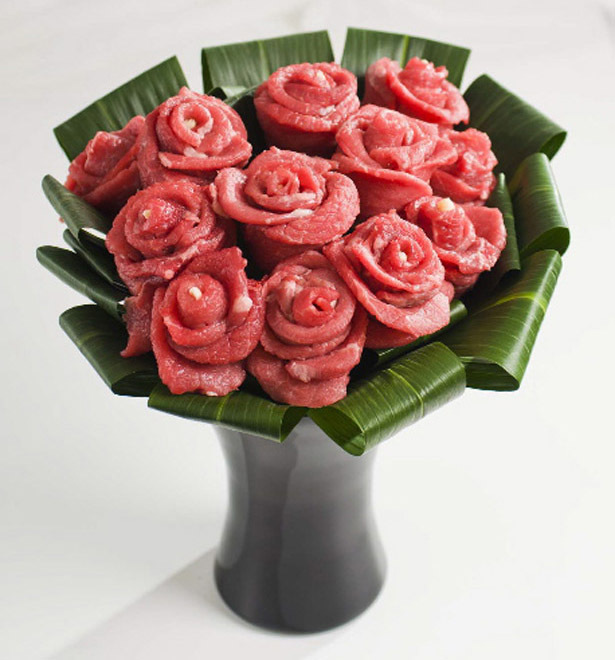 I mean if you can make a dress from meat, then why not a bunch of roses? I found these pictures by Pictures-93 while surfing around on Pinterest (I think i don’t really remember I just found that I’d made a draft post and thought I’d better publish it). Black and white pictures with colourised symbols from deck of cards on the lips.